Just like the lyrical sheet does not mince words, Swedish Aeon do not camouflage their musical intentions either. This is brutal death metal, sharply pointed and intense. A large number of tracks on the album are absolute barrage of crushing sound seething with dislike and loathing (Still They Pray opener, The Glowing Hate, Nothing Left to Destroy easily come to mind). You can’t create this type of metal without devastating knowledgeable production, outstanding drummer and powerful vocalist. Aeon has all of those basic ingredients. Ronnie Bjornstrom of Garageland Studios knew how to dial the buttons. Tommy Dahlstrom has excellent command of low growls with an occasional high riser of a shriek; when he wishes you death on the eponymous track, it is damn convincing and believable. And the drummer Arttu Malkki steals the show with his booming howitzers switching from groovy double bass to faster blasts. Aeon tries to present variety on Aeon’s Black. Whether they succeed entirely is debatable, and it is probably difficult to do so in the genre, but they definitely try, at least in the tempo and rhythmical sense. A number of songs have speed inflections (Still They Pray, Dead Means Dead), but when the band tries to unhinge themselves to go thrashing they can’t leave behind their monstrously heavy foundation (I Wish You Death, Dead Means Dead). The slower groovier tracks on the album are just as overwhelming as the speedy ones. Led by the hellish legions intro Passage to Hell, the title track and especially Blessed by the Priest are towering and doomy condemnations, infused with just that minute touch of melody which elevates bands like Immolation above many others. Aeon are still to learn how to elevate their songs throughout the album. The closer Die by My Hands is an excellent representation how a few harmonies can bring the track to another level with apocalyptic vision, while making the whole experience no less aurally devastating as, say, bruising one-notes The Glowing Hate, Garden of Sin and Maze of the Damned. 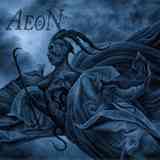 Aeon’s guitars do not come to the forefront and lead with those quick melodic touches enough. They often settle into a characteristic chug, and crazy squeals often substituting for leads do not give the album enough melodic identity. And it isn’t that the band is melody averse. Short melodic instrumental tracks interspersed throughout the album provide pointed and necessary relief, but I venture to say that blending those into the full-size songs would have been a winning approach. Aeon does not need to become as melodic as Amon Amarth, but there is an opportunity for them to learn the subtleties of Immolation or choose the straightforwardness of Deicide. The answer to whether you will like Aeon’s Black lies in a simple question. Can you last 50 min on a single intense emotion? If you are prepared to clench your fists and detest Christians for that long, Aeon’s Black is just your thing.